The Leica DMIRB is a computer-controlled conventional wide-angle (non-confocal) microscope. Its inverted nature means it is uniquely designed for use with cell culture experiments. 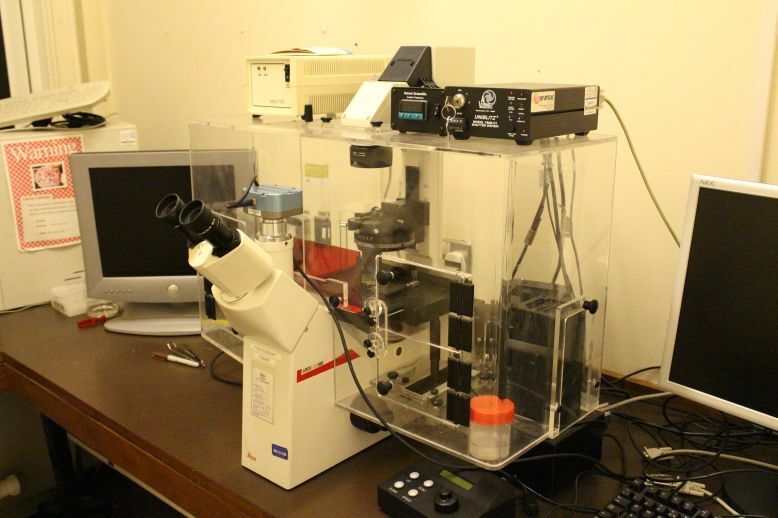 It is equipped with a stage accepting a range of plates and microscope slides and a high-resolution CCD camera. There is maximum flexibility in using the microscope for effective contrasting methods such as Brightfield, Phase Contrast, Darkfield Contrast, Polarization Contrast, Leica Modulation Contrast, DIC and Fluorescence. The microscope is fixed with a Solent Scientific transparent environmental chamber. This incubation chamber is used for prolonged studies of living cells, including time lapse image capture experiments for cell motility and cell death. The Leica DMIRB is a viable alternative to confocal microscopy that is not always the best solution for imaging needs and, in some situations, may even be counter-productive. The Leica DMIRB can produce similar results and offers as much flexibility. The dedicated FW4000TZ software handles image captures and use and offers a total fluorescence imaging solution. Microscopy  Leica Modulation Contrast optics. 10, 20 and 40x objectives. Environment  Solent Scientific transparent environmental chamber. Warm, filtered air circulates within the acrylic chamber from a heater unit that is mechanically isolated from the environmental chamber. Two doors allow specimens to be changed and the condenser settings to be adjusted. A further two doors, below the stage, allow access to the nosepiece and objectives. Focusing and stage controls remain outside the environmental chamber. The 35mm camera, video camera, multi-viewing and fluorescence capabilities of the microscope are unaffected. The chamber can, when required, be quickly removed without the use of hand tools. Microscope Control  FW4000TZ software (see below) allows user to perform time-lapse experiments with automated shutter control to prevent excessive exposure of specimen to transmitted light. The motorised focus allows for Z-stacking (multiple focus during experiments).